Most shoppers want what they see. Whether it is an outfit on a mannequin or a waiter serving an entree to the adjacent table, we live in a visual society that entices us at every turn. Its not that we aren't creative or adventurous enough to try something unknown, but if something of beauty struck a cord within us, why fight it? WALLTAT Wall Decals knows the importance of offering appetizing photos of our Wall Decal products. Not only do we offer room scenes of every design, but we also show the design by itself and usually in an alternate color. We realize that sometimes even seeing two color options isn't enough, so we started incentivizing existing customers to share their installations with us, so that we can in turn can share them with you! On the reverse side of our Installation Brochure (that every customer receives with their order), there is a section called "Show and Tell" which requests that each customer to take a quick snap shot of their new WALLTAT installation and post it onto our Facebook page. For the extra effort, we happily issue a 10% OFF coupon code for a future purchase. Voila! It's that easy. So remember, sharing is caring, but it can also be lucrative. Here are just a few recent installations from our WALLTAT friends with beautiful taste and willingness to try a fun new product. C'mon, be the next to share! "Pam" shared her Fishing From the Dock WALLTAT installation with us. It makes an excellent addition to the plaid bedding to complete the camping theme in her boys bedroom. 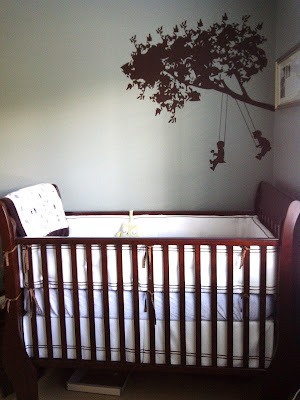 "Sonoma" submitted this photo after welcoming a new baby into world. 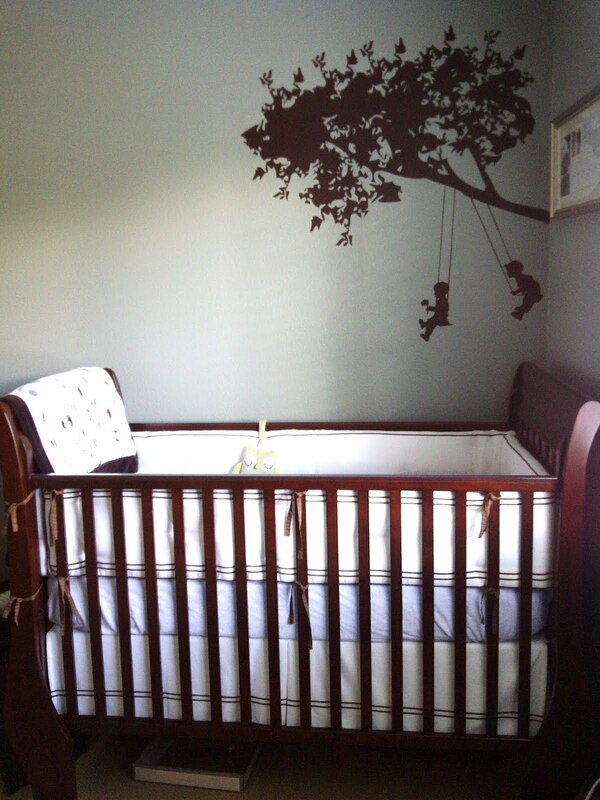 The chocolate color of the Kids On Swings WALLTAT Wall Decal ties in perfectly to the wood tones in the crib. This is definitely a design that will last well into the toddler years for both boys and girls bedrooms. "Pol" was excited to share her installation of her foyer walls, with the addition of dragonfly hooks that appear to be floating around the Ear of Wheat WALLTAT design. How creative! Regardless if you recreate a wall decal design from our customer installation photos, or from the display photos on our website, we still applaud your willingness to explore the world of home decor. We champion anyone eager to make a design decision to better themselves or their home! Sometimes its not easy making those creative decisions, but with removable wall decals by WALLTAT, you can change them as frequently as you would like, without consequence!